Fall magic was in the air for this wedding! When we got the gallery, our mouths just dropped at how beautiful the photos are. Natasha just kills the game with her photography skills; we are just in awe by her ability to capture a fairy tale feel. Along with working with Natasha, we ran into our friends at Nalia’s Events where we watched them set up a ceremony that belongs in a movie, and created bouquets of flowers that will become the most pinned floral arrangement of all time!! Although we didn’t get the pleasure of doing Tiffany and her bridal squad’s hair; we were happy to have made a new friend there! Elle from Blissful Beauty 365, created effortless hairstyles, even we were in awe! The whole wedding just seemed like scenes taken from a rom-com based in Minneapolis. You can see the beautiful leaves changing and the iconic Stone Arch Bridge. Minneapolis brides, there is so much magic to still be discovered! We would love to see a bride take some photos by the Mill Ruins area -until then we can just be mesmerized by Tiffany and Brad’s wedding day! What an amazing venue! Just 30 minutes outside of Minneapolis, which makes it not too far out of the scene yet giving you the rustic, farmhouse feel -which calls for phenomenal photos! Great space with a loft overlooking the inside and plenty of space to host a ceremony outside under a beautiful arch. 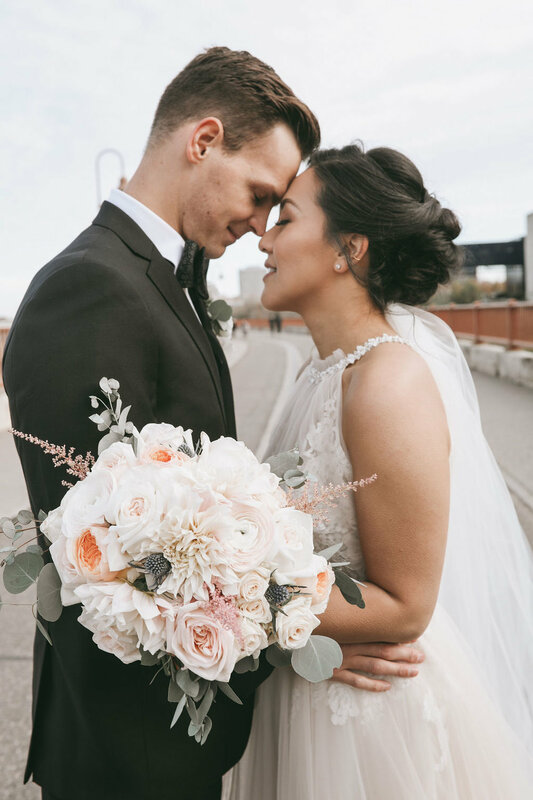 This styled shoot organized by the amazingly talented wedding planner, Merissa of Nicole’s Treasured Memories. Our experience with her was that she’s organized, communicative, and detailed oriented. Everything you would want in a wedding planner -not to mention she has a list of recommended vendors, which will help you with the wedding planning stress! There were two incredibly talented photographers that we got to work with on this photoshoot at The Outpost Center in Chaska, Minnesota. Daniela Rollin of Daniela Rollin Photo Co and Kayla Warwick of KP Photography! Both are incredible photographers, outgoing personalities and an eye for detail! LHNBEAUTY had the pleasure of doing makeup for both Ruth and Krissi. We also got to meet Sarah of Sarah Jane Salon -who is amazing! Weaving a flower crown in hair can be a task sometimes, but she did it flawlessly! Now we know you’re dying to look at photos! So here we go! We couldn’t believe how amazing the photos turned out and how beautiful the venue is. Everything was just amazing from the decor by Event Lab, the baked goods from Silver Lily Sweetery, the jewelry from Style by Cia, and of course the florals from Shara’s Floral Designs. We highly recommend checking out all that was a part of this styled shoot for your wedding! We had an amazing time chatting with everyone and watching the magic unfold. We hope these photos inspire all you future brides with ideas because we certainly were!